This series of prints arose from Howard’s fascination in the industrial history of Birmingham which included the role of its extensive canal system and later the new M6 motorway and the elaborate interchange designed to provide links to existing roads serving the city, which became known as ‘Spaghetti Junction’. The junction covers about thirty acres with elevated sections on five levels supported by 559 concrete columns spanning a river and canal network, as well as a railway. Its nickname came from a journalist on the Birmingham Evening Mail who described an aerial view of the plans as looking like a bowl of spaghetti. Howard’s views of it are, however, seen from the ground below, using strong contrasts of light and shade to emphasise the geometry of the monumental structures. 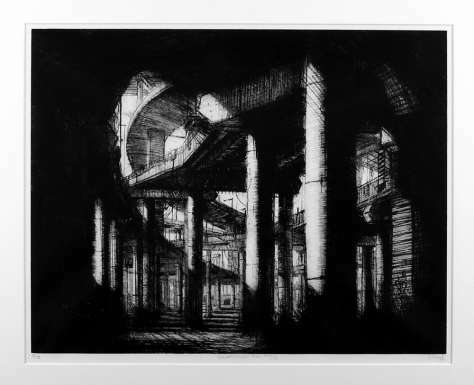 Their composition was influenced by Howard's interest in the eighteenth century artist Giovanni Battista Piranesi whose 'architectural fantasies' manipulated true perspective and scale. The Spaghetti Junction etchings are similarly dramatic and theatrical and the absence of people, cars or road signs lends an eerie quality to the work.